(CNN) -- It started with a photograph. A little boy stands beaming in his plaid jumpsuit, hands on his hips and knee cocked just so. "This is a gay kid," thought Los Angeles-based DJ "Paul V.," as he looked at the happy, smiling face. And with that, Born This Way was, well, born. "My first thought was, 'Wouldn't it be great if there was photographic evidence of gay kids that would show that being gay is something innate and it's not a choice and that these things come out in us as children?' " he says. Paul V., as he is known professionally, mulled over the idea of turning the concept into a coffee table book, but wanted to move faster after the rash of teen suicides attributed to anti-gay bullying in fall 2010. He created a blog. "I got so angry and so upset and so sad and I just felt if there was a way to be another voice of support for gay kids -- along with the It Gets Better campaign or The Trevor Project -- that it would be a place online where kids could get a little solace and see themselves in the stories." Paul V. began by soliciting childhood photos from friends on Facebook and asked them to write a brief story to accompany the picture. Dennis Skeen, whose photo was the inspiration for the site, didn't hesitate to contribute. "I was honored," he says. "It's good to have it out there on the internet where everyone has access to it, but it can show people who are struggling to come out that there are lots of people who've made it through and it can be inspiring." The photographs span decades, with the oldest dating back to the 1940s. The stories are sincere, moving and often times laugh-out-loud funny. "The picture gets your attention and it makes you laugh and then you read the stories and they're really heartfelt," says Skeen. Isaac's post includes a photo taken at age 7 where he's the standout in a shot of three boys. Isaac and most others interviewed for this story asked that their last names not be used. "At this point in my life I lived a blissfully unaware gay lifestyle: Having all female friends, really REALLY liking Catwoman and always trying on my friends' fake plastic high-heeled shoes when I went to their house," he writes. "I actually didn't realize I was even close to being gay until my graduating year of high school, so this photo is one of those things I look at now and think to myself, 'How did I NOT know?!'" Jimmy reflects on growing up in a small town in Washington. "I always tried to act tougher, but it was never me, nor did it fool anybody. And when I tried to change who I was, it only made things worse," he writes. "Now every step I take is with my head held high, instead of looking towards the ground and hoping nobody screams any more names at me. All the good and the bad from my childhood made me the man who I am today, and I love that person." As word of the blog spread, Paul V. soon found himself sifting through submissions from all over the world. Although the blog is aimed at encouraging young gays and lesbians to persevere, Paul V. says that parents can take away lessons from the site as well. "There is no question that your child deserves your unconditional love and support and encouragement to be themselves," he says. "Kids are fluid and should be able to let their imaginations dictate the things they like and the things that they love and the things that make them happy. " 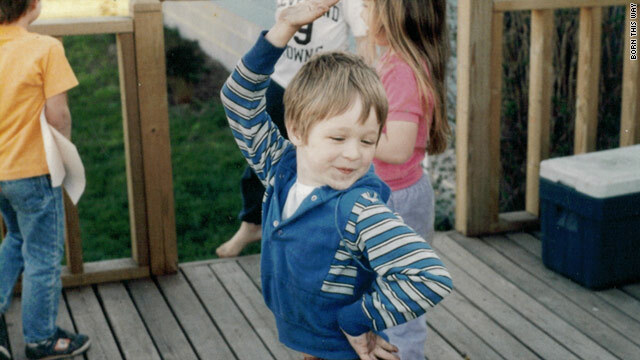 Kevin is depicted in the blog's inaugural post as a cherubic 4-year-old posing before a baton recital. He says parents shouldn't restrict their children to traditional roles. "Children should be free to explore who they are and develop into wonderful, fantastic, artistic creatures - gay or straight," Kevin says. "I would imagine that if we didn't have society telling us that 'boys can't do this' and 'girls can't do that' that there's no telling what sort of wonderful person we could become." With more than 1 million hits since its debut in January, Paul V. says the response to the blog has been overwhelmingly positive. When asked what he would say to those who might say the site perpetuates negative stereotypes, he says, "Stereotypes exist for a reason, because they are true on some level. As the gay community has every shade of masculine and feminine, the people on my blog are simply representing -- and owning -- all those various shades but without the shame or guilt that society has assigned to those traits." 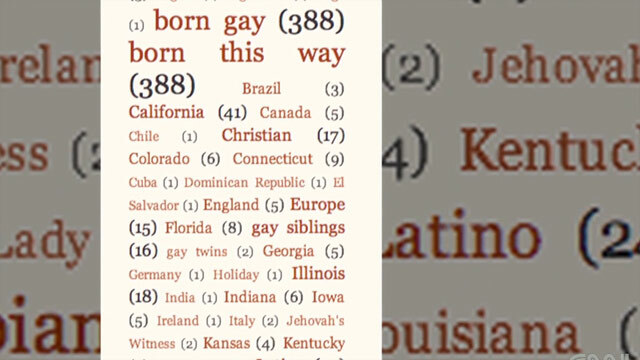 Paul V. hopes to go through with his original plan to publish Born This Way as a coffee table book later this year and would love to get submissions from prominent gay and lesbian men and women such as Neil Patrick Harris, Ellen DeGeneres, RuPaul and Sir Elton John. "People need to realize that 20 and 30 years ago they were just awkward kids who were struggling in their junior high and high schools. Even if they didn't know they were -- quote -- 'gay' at the time, they knew they were different," he says. "If there's just one moment where a gay kid is reading my blog and feels that sense of connection and that sense of self-worth and it saves one life I'm thrilled."